From the outset of its establishment in the Philippines in 1901 as a Missionary district of the Episcopal Church in the USA, our church's missionary policy has been to work with and not against other established Christian churches in the Philippines. As such, our broad evangelical focus has been on those who were previously unchurched, as well as the growing expatriate population of Manila. We have also worked in bringing the Good News of the Christian Gospel to those who were previously neither subjected by Spain nor converted to Christianity. Thus our Episcopal Church is represented strongly in Mindanao and among the tribes of the Cordilleras of Northern Luzon. 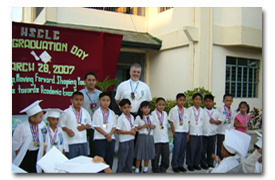 As a member church of this communion and within the central business district of Manila the focus of our own outreach activity has been threefold: first we bear witness among the expatriate population and offer those who are new to Manila or living a transitory lifestyle the opportunity for true Christian fellowship. Our church also offers special programs for women and a home to a number of community service groups that are not directly affiliated with our church but which would otherwise be lacking permanent facilities from which to work. Secondly, we work to support other parishes within our diocese but which have not so far become totally self-supporting. This includes especially the parishes of Taguig and Tagaytay. Finally we offer a Christian consciousness to the broader community and especially those sections that bear the burdens of the inequalities in our society. We seek to offer a voice - and where necessary, affirmative action - on social issues such as the rights of labor, of women and especially of children so that all can understand personally the power of God's love through Christ.